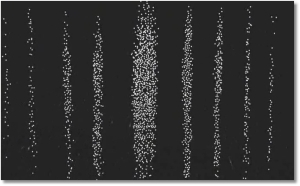 The results of the double-slit experiment tell us that electrons produce the same kind of interference pattern as both water waves and light waves, not of marbles or any other “lump of matter”. If we stick to a strict categorisation of all matter as either a wave or a particle, the double-slit experiment suggests that we must treat electrons like waves, not point particles. But we know electrons have other properties which we would not usually associate with a wave, such as having a definite position and mass. Does this suggest that we should embrace a “wave-particle duality” about matter? That things can have both wave properties and particle properties simultaneously? When we perform the double-slit experiment, the results are a series of bright dots on a screen showing us where the electrons have hit it. This is very difficult to explain if we think the electron is a wave. The electrons certainly hit one position on the screen, suggesting that they have a definite position, but there’s no meaningful way of attributing a position to a wave. Waves are, by nature, spread out over space. But this interference pattern is only explicable if we adopt a wave model of the electron. The two dark patches around the middle light strip should be bright if the electron were a particle – they’re directly behind the slits. It makes very little sense that the middle of the screen, which is blocked directly by the sheet in front of it, should record the most hits. The only way to explain this interference pattern is through treating the electron as a wave, but if we do this we can come to even stranger conclusions. If we are to treat the electron as a wave, we should understand how the interference pattern is generated by the wave model. Very crudely, a wave looks like this. If we have two waves like this that encounter each other, the amplitude (the height of the wave above the black line) of the new wave is found by adding the height of the first wave and the height (heights can be negative) of the second wave – nothing complicated here, but this has a special name: “The Principle of Superposition”. In the gap between the solid plate and the photographic plate (the screen), the two waves meet each other and one must apply the principle of superposition. In some places, the peak of one wave will meet the peak of the other. This is known as constructive interference and it is in places where this occurs that you get bright spots on the photographic plate. In some places however, the peak of one wave will meet with the trough of another, and their amplitudes will cancel out completely. This is destructive interference and in places where this occurs you get dark spots on the screen. To understand intuitively why the middle of the screen is bright; what determines how things interfere is difference in path length. Since the two waves must travel the same distance to reach the middle of the screen from each slit, the peaks will meet peaks and so constructive interference occurs. How can we apply this reasoning to an electron? To produce the interference pattern, the wave interferes with itself after it goes through the two slits. But if we fire electrons one by one at the slits, what do they interfere with? Does it make any sense to say that the electron interferes with itself? The fact that each electron arrives at a single point on the screen suggests that electrons have definite positions – they are located at a point. To explain the interference pattern however, we are forced to describe the electron as a wave that goes through both slits, and all possible pathways through them, at the same time so that it can interfere with itself. The reconciliation of these two behaviours is at the heart of the mysteries of quantum mechanics. But something even more surprising lies in wait. It seems ludicrous to suggest that an electron can go through both slits at once, this is counter to all our intuitions about particles! The interference pattern is weird, but surely at least we should be able to say that the electrons only go through one slit or the other. Well, we can place detectors at the slits to observe which slit each electron actually goes through. If we do this however THE INTERFERENCE PATTERN DISAPPEARS. If we try to measure which slit the electrons go through, we detect each electron go through only one slit or the other, but now the experiment produces a particle pattern, not a wave pattern. The electron seems to know when we’re observing it, and when we’re observing it like it’s a particle, it behaves like a particle! This is possibly the most central mystery to quantum mechanics – why observation matters. Coincidentally, because of the difficulties this mystery presents, it is at this point where pseudoscientists and crackpots have the most joy – but more on this another time. In the next article I will tackle the role of observation in quantum mechanics – why it’s mysterious, but also why it’s often given far too much weight by popular science.